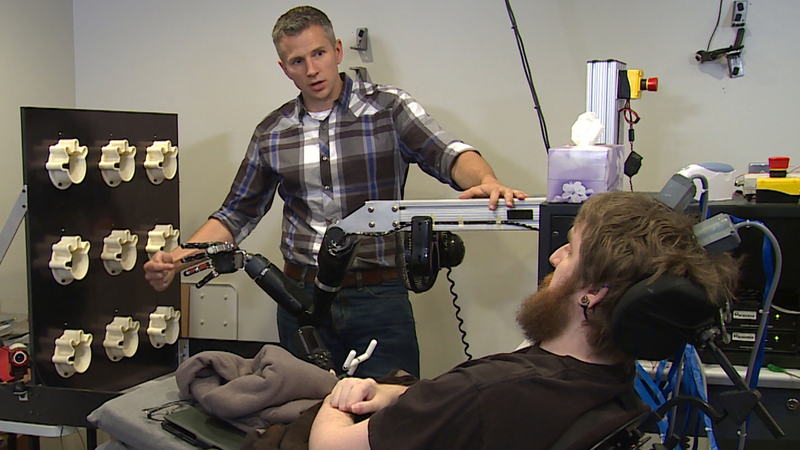 A decade after losing the ability to feel or move his lower arms and legs, 28-year-old Nathan Copeland is able to experience the sense of touch through the use of a robotic arm that he controls with his brain. “I can feel just about every finger—it’s a really weird sensation,” Copeland said in a press release issued late last week. A team of researchers from the University of Pittsburgh, working with the University of Chicago, designed the brain implant that allows Copeland to sense touch via a robotic hand. The implant, known as a brain computer interface, is connected to a robotic arm that sends sensory feedback through electrodes implanted in areas of the brain that control hand movement and touch. The breakthrough incorporates nearly 20 years of research on the neural basis of touch by Sliman Bensmaia, associate professor of organismal biology and anatomy at the University of Chicago. His research focuses on how the nervous system receives and deciphers sensory feedback when people touch or grasp objects, move their limbs and touch textured surfaces. In 2006 he began working on artificial touch and neuroprosthetics as part of the Revolutionizing Prosthetics program, a Defense Advanced Research Projects Agency (DARPA) initiative aimed at creating an artificial upper limb that restores motor control and sensation in amputees. Using his knowledge of how the nervous system interprets touch, Bensmaia said he was tasked with seeing if that could be replicated by electrically stimulating the nervous system. In experiments with monkeys, whose sensory systems resemble those of humans, Bensmaia identified patterns of neural activity that occurred naturally as the animals touched objects. Using a high-precision robot, researchers trained monkeys to identify patterns of physical touch, Bensmaia said. These physical touches were replaced with electrical stimulation delivered through electrodes implanted in corresponding parts of the brain. “We wanted to see if the animal behaved as if it had been poked a specific way,” Bensmaia said of the electrical stimulation. The findings of the study were recently published in the journal, Science Translational Medicine. Sept. 29: A baby has been born with the DNA of three parents. We hear about the promise the technique offers for avoiding some birth defects, and the ethical concerns it raises. Sept. 28: New technology developed in Chicago could lead to major advances in healing broken bones and other sports medicine injuries. Sept. 26: Nearly 107,500 lives could be saved each year in the U.S. if a more intensive approach to lowering high blood pressure was implemented, a recent study asserts. Sept. 21: A new form of cancer treatment developed by University of Chicago scientists was so effective in studies that one researcher said it’d be a “breakthrough” if it were replicated in humans. Sept. 30, 2015: An ambitious new government-led research initiative aims to fully map the human brain. The goal is to advance understanding of how the brain works and develop treatments for crippling neurological diseases.